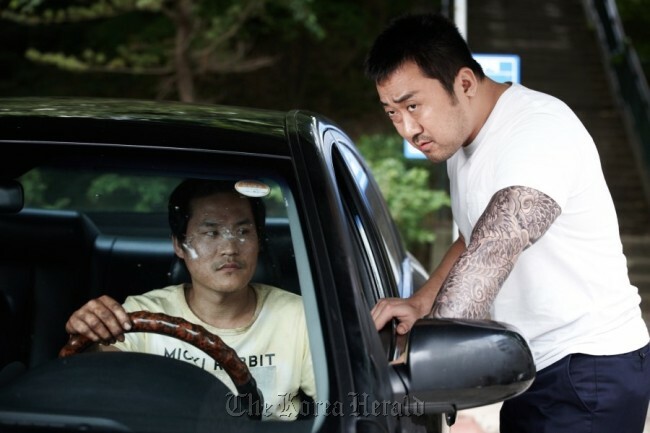 Countless films in the past have featured a serial killer, but Kim Hwi’s latest thriller based on Kang Full’s 2008 webcomic takes a refreshingly different approach. For the sake of suspense and excitement, many noir-thrillers do not reveal the identity of the killer until the very end. But in “Neighbors,” it is clear who the criminal is right from the beginning. He in fact kills his own neighbors ― including a middle-school girl ― living in his building, and continues to stay there even after committing the grisly murders. One of the most significant achievements of the film is that, despite the killer’s known identity, it manages to keep the audience on the edge of their seats throughout the running time. “Neighbors” isn’t just about the murderer. It comprehensively deals with the ordinary residents, the police as well as a struggling ex-con. The murderer’s neighbors are selfish rather than indifferent. Some of them, in fact, discover clear evidence of the man’s crime, but choose not to act. One does not want the real-estate price to go down. One has only five months left before his statute of limitations runs out. Many simply don’t want to get involved. What is interesting is their shared avoidance of the police. No character ever calls for their help. The police are portrayed as lazy and incompetent. Instead of trying to track down the criminal, they simply ask Hyeok-mo, an ex-con who works as a loan shark in the area, to come in for a meaningless investigation. No policeman ever encounters the criminal, not even once, in this movie. Ironically, it is the ex-con who chooses to take action and tracks down the killer. On top of that, he is the only character who is physically stronger than the gruesome criminal. Such a set-up certainly contains critical undertones about the exercise of public power and the government authority. The residents’ selfishness, as well as the incompetence of the police, ultimately allow the criminal to continue his killings. One of the shortcomings of the film is the character development of the villain. The audience never gets to find out who the man, who seems to be in his 30s, really is, and what led him to commit such heinous crimes. In the beginning of the film, he looks like a plain psychopath incapable of feeling love or compassion. In the end, however, it is revealed that he’s been suffering from hallucinations brought on by guilt. His feeling of guilt is somewhat unconvincing, however, especially because the motives of his crimes are never explained. The murder victims appear in the form of ghosts that the living characters, including the criminal, see in their hallucinations. This creates a striking horror-movie effect, and somewhat successfully delves into the psychology of guilt. All of the movie’s cast, including Kim Yun-jin, Ma Dong-seok and Kim Sae-ron, put on engrossing performances, adding depth and complexity to the characters. A Lotte Entertainment release, “Neighbors” is currently showing in theaters nationwide.